Ariel Kachuro/Assistant Photography Editor Senior forward Rebecca Carmody put up a double-double with 16 points and 12 rebounds in Binghamton’s failed comeback effort against Niagara. With just 34 seconds to go, tensions were high in the game between the Binghamton women’s basketball team and Niagara. As the score was tied 70-70, the Bearcats, flustered by the situation, ultimately fouled their way to a loss, 79-72. Immediately after making a 3-pointer, senior forward Rebecca Carmody was called on a technical foul, giving Niagara’s junior guard Maggie McIntyre two free throws, both of which she made. Immediately following Carmody’s foul, sophomore forward Kaylee Wasco fouled Niagara’s junior guard Jai Moore, giving Moore two free throws, both of which were made. Despite the four-point lead with 28 seconds to go, Binghamton (5-4) attempted to obtain the lead. Sophomore forward Olivia Ramil, with an assist from freshman guard Hayley Moore, was able to net two points for the Bearcats with a layup; however, the Bearcats were forced to keep fouling Niagara (2-6) in order to get the ball back, and the Purple Eagles nailed all of their free throws. By connecting from the line, Niagara was able to salt the game away, eventually winning by a seven-point margin. Although Carmody, Wasco, Ramil and Moore all had fouls at the end of the game, they were some of the most critical players on the court Wednesday night. Carmody came out strong in the first period, almost immediately scoring two 3-pointers, putting Binghamton up six points in just two minutes. In fact, Binghamton dominated the first quarter, never allowing Niagara to take advantage and ending the quarter with a lead of 15-8. Carmody totaled eight points in the first quarter and had six rebounds, and went on to post 16 points and 12 boards. Ramil was also strong in the rebounding category, coming away with four rebounds in the first period alone. Ramil really began to shine in the second period, as she was able to get five points for the team. Throughout the rest of the match, Ramil worked her way up to 13 points and 14 boards, a season high in both categories. Wasco was also able to get a season high in points, coming away with 13. Most surprising, however, was Moore’s appearance Wednesday night. The freshman hadn’t seen much playing time before the game against Niagara, but Moore made the most of her playing time in last night’s match. Moore did not take her first shot until the third period, but when she did, Moore was able to convert a 3-pointer on her first go. Throughout the rest of the period, Moore converted two more three-pointers, and in the fourth period, Moore registered two layups, ending the game with 13 points, a career high. Junior guard Carly Boland also had a notable game, as she came away with 11 points, seven rebounds, four assists, three rejections and a steal. Boland, coming in at 6’1”, has excelled in several categories this season and most notably has 15 blocks this year already. Even though several Binghamton players had strong showings this match, it was difficult for the Bearcats to combat McIntyre’s 3-pointers and accurate free throws. McIntyre was not only Niagara’s leading scorer with 24 points, but she also doubled the total points of the next highest scorer on Niagara’s team. The Bearcats, well aware of McIntyre’s success on the court, ultimately dropped the game by repeatedly fouling McIntyre, along with two other Niagara players, in the last 30 seconds of the game. 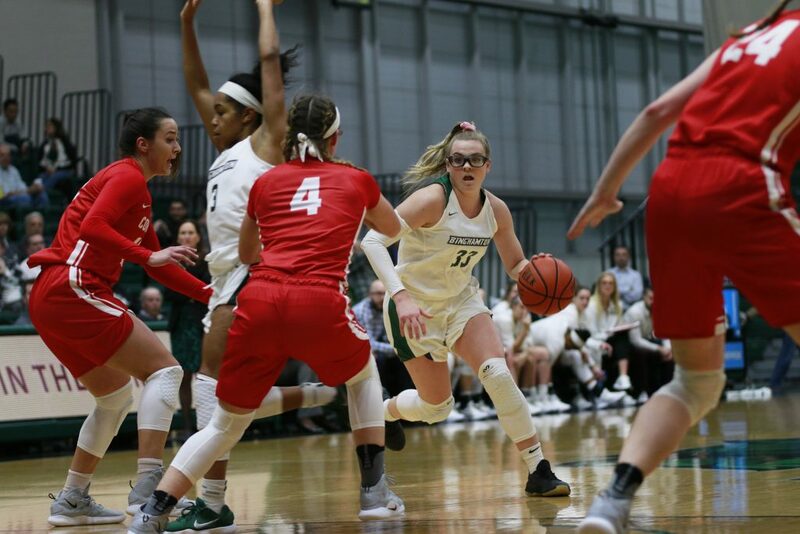 While the Binghamton women’s basketball team just went through a deflating loss, they will look to put this defeat behind them and prepare for this Saturday’s home game against Rider University. The game is scheduled to tip off at noon in the Events Center.